"Don't give up on him too easily. He's quite a cute little fellow, isn't he?" 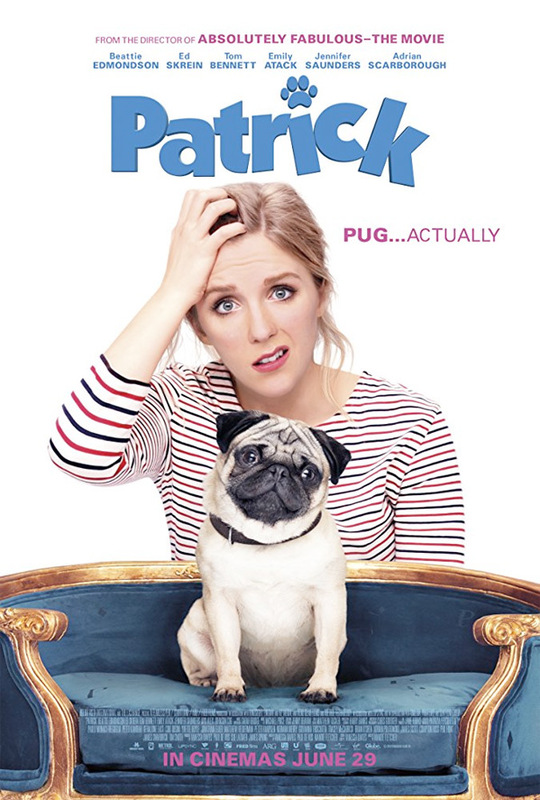 A new official trailer has debuted for a fun indie comedy titled Patrick, about a spoiled pug named Patrick who gets bequeathed to a young woman who is having some typical troubles in her life. As expected, the challenging pup provides some good laughs and plenty of pain, but he also helps her get back on track - with falling in love. Aw, how romantic, right? Beattie Edmondson stars as Sarah, and the cast includes Ed Skrein, Emilia Jones, Jennifer Saunders, Meera Syal, Gemma Jones, Emily Atack, Cherie Lunghi, and Peter Davison. This looks even worse than Dog Days, and that's a shame since lovable dog movies should be better than this. Oh well. Sarah (Beattie Edmondson) is a young woman whose life is in a bit of a mess. The last thing she needs is someone else to look after. Yet, like it or not, her Grandmother has bequeathed her a very spoiled pug - Patrick. Surely she must have had her reasons, right? Patrick is directed by English filmmaker Mandie Fletcher, director of the films Deadly Advice and Absolutely Fabulous: The Movie previously, as well as a lot of additional TV work. The screenplay is written by Vanessa Davies and Mandie Fletcher and Paul de Vos. This hasn't premiered at any film festivals or otherwise before. Fletcher's Patrick already opened in UK cinemas in late June. No official US release date is set yet - stay tuned for updates. Who wants to see this?